USA Idaho Wrestling News and Wrestling In-The-News in Idaho..
USA Idaho Nationals Results Posted.. see trackwrestling.com city-search orem for Kids Nationals Freestyle and Greco.. See our list of All Americans and Medal counts.. Seventh grade Lowell Scott student, Hayden Tuma, was awarded the Ultimate Challenge Belt at the 2009 Asics Folkstyle National Championships in Cedar Falls, IA on April 5. The belt is awarded to the top-three wrestlers in each age-group division earning points from a series of twelve tournaments that are conducted in 11 different states – California, Florida, Georgia, Idaho, Illinois, Indiana, Iowa, Missouri, Oklahoma, Utah and Wisconsin. 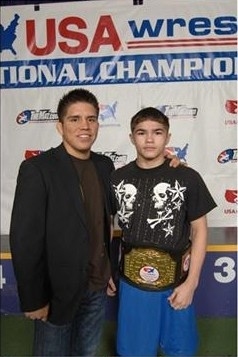 Olympic Freestyle Gold Medalist Henry Cejudo awarded the belts to each wrestler. Tuma, who started wrestling at age 8, wrestles all three styles of wrestling, Folkstyle, Freestyle and Greco. At the 2009 Asics Folkstyle National Championships he earned a 2nd place at the 105 lbs. Schoolboy/girl division, capturing his eighth “All American” title between all three styles. “I’m very proud of my son. He works hard year round. We are fortunate to have great wrestling programs like Bullcatcher, Kuna and Patriots,” said Janie Tuma. 2009 Junior/Cadet Triple Crown Champions annouced. Dear State Chairpersons: Please find below a link regarding this year’s USAW Rule Book and Guide to Wrestling. If you can post this on your State Association website we would greatly appreciate it, and it will help spread the word that the new Rule Book is available online and down loadable. Thank you.